On September 30 after the surgical strikes, Chandu Chavan from 37 Rashtriya Rifles had inadvertently crossed over to the other side of the LoC. A file photo of Indian soldier Chandu Chavan. 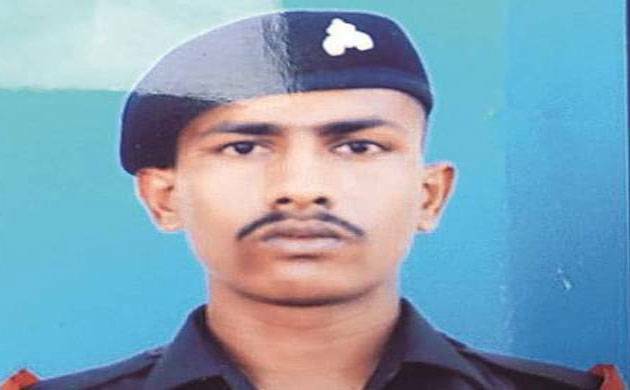 Union Minister Subhash Bhamre said on Tuesday the government is making all efforts for the safe return of 22-year-old soldier Chandu Chavan, who is in Pakistan's custody after inadvertently crossing the LoC. "We are in contact with the neighbouring country (Pakistan) through DGMO and diplomatic channels and one good thing is that Pakistan has acknowledged that Chavan is in their custody. Today or tomorrow, they will have to return Chavan to us," the MoS for Defence told reporters on the sidelines of the passing-out parade (POP) of the 131st course of the National Defence Academy (NDA) held in Pune. Bhamre assured that as soon as the situation (at border) gets back to normalcy, Chavan will be brought back. "I am in touch with the family of Chavan as he is from my constituency," said the MP from Dhule in Maharashtra. On September 30 after the surgical strikes, Chavan from 37 Rashtriya Rifles had inadvertently crossed over to the other side of the LoC following which Pakistan had been informed by the DGMO (Director General of Military Operations) on the hotline. He has been in Pakistan's custody since then. Soon after the news broke, Chavan's aged grandmother Lila Chindha Patil had died of shock. To another query, the minister said OROP was pending for 40 years. However, since Modiji (PM Narendra Modi) assumed office, he gave priority to OROP. "There are a section of people who are spreading lies about it (OROP). However, 90 to 95% ex-servicemen are happy. Yes, there are some anomalies. But efforts are on to get rid of them as the government is studying the report submitted by one-member committee," he said. The Centre had appointed a committee under the chairmanship of retired chief justice of Patna high court L Narasimha Reddy to look into the anomalies. He said the government thrust is on indigenisation of products in the defence sector. "(under Modi government) Indigenisation has increased and India is one step towards self reliance," Bhamre added. Talking about the terrorist attack on an army camp at Nagrota near Jammu, he said, "We expect peace from our neighbouring country. But our forces are alert and we are proud of them. We are ready for any kind of challenge, be it military or any other kind of aggression."